Preheat oven to 150°C (300°F). Place the almonds, dates, rice flour, cacao and egg yolk in a food processor and process for 2 minutes or until the mixture comes together. Divide the mixture between 6 x 8cm lightly greased round loose-bottomed fluted tart tins and press into the bases and sides. Place on a baking tray and cook for 10 minutes. While the bases are cooking, make the cheesecake filling. Place the cottage cheese, yoghurt, egg, cacao, sugar and vanilla in a clean food processor and process until smooth. Place the cornflour and water in a small bowl and stir until smooth. Add to the food processor with the melted chocolate and process for 1–2 minutes or until well combined. Divide the mixture between the tart shells. Cook for 15 minutes or until just set. Place in the fridge to cool completely. Remove from the tins. To make the chocolate sauce, place the cacao, maple syrup, vanilla and boiling water in a small bowl and whisk until smooth. 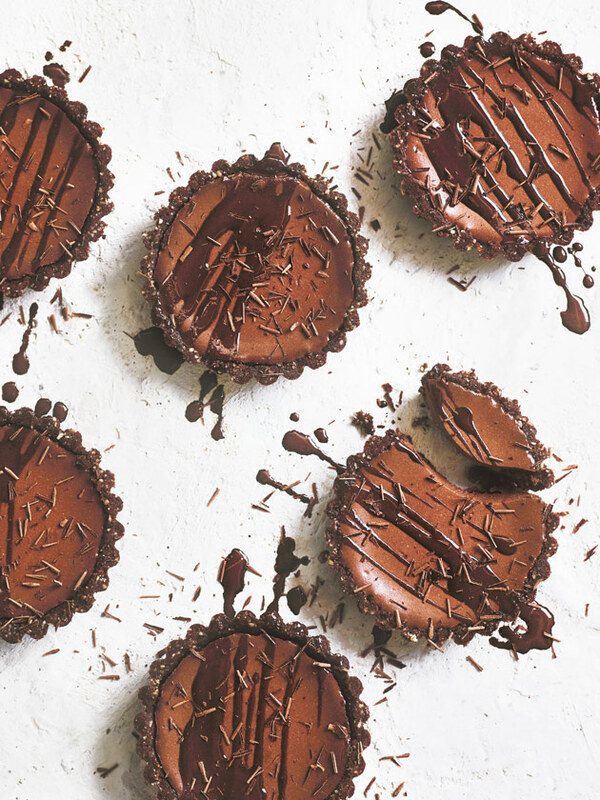 Drizzle the tarts with the chocolate sauce and top with shaved chocolate to serve. Makes 6.